Work in luxury with Norwood Commercial Furniture Executive chair with Flip-up arms. This chair features a tall back and overstuffed padded Seat to support almost any body Type. The padded armrests keep you comfortable all day; simply Flip them up and out of the way when you need extra space. Adjust the Seat using the Pneumatic height lever and the locking-tilt mechanism. Padded arms add additional comfort. Easily roll the chair easily thanks to five casters at the star base. - black. 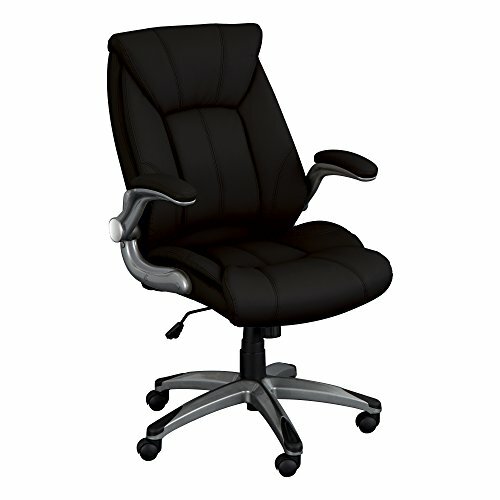 Features a tall back and overstuffed padded seat to support almost any body type. Padded armrests keep you comfortable all day; simply flip them up and out of the way when you need extra space. Adjust the seat using the pneumatic height lever; locking-tilt mechanism.